Mainly hardy annuals in this little harvest from my Cornish plot last year. It is an indubitable fact that one of the greatest pleasures to be gained in the domestic flower garden is growing earlier, bigger and generally more flouncy flowers than one’s neighbours. This is not to say that one becomes showy offy or should throw unsolicited advice over the fence concerning the proper husbandry of Centaurea cyanus. 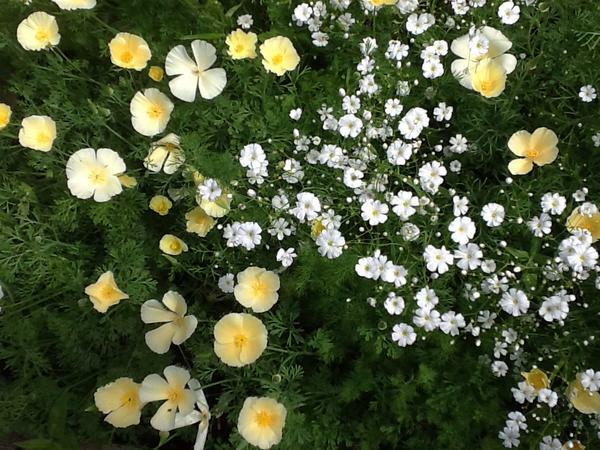 Having a plump and juicy bed of dedicated autumn sown hardy annuals that are happily flowering in early June, will have Mr and Mrs Jones all of a fluster. Try popping round with a fist full of creamy blue Nigellas and lava hot Calendulas and say something along the lines of, “Oh Clive, do you have room for these anywhere?…we simply haven’t got the space for any more cuts in the house…you’d be doing us a tremendous favour…you know what these gluts can be like…”. Watch carefully through the returned pleasantries and you will see the twitch of seething jealousy in the corner of their eyes. They secretly wish they could be a little bit more like you. 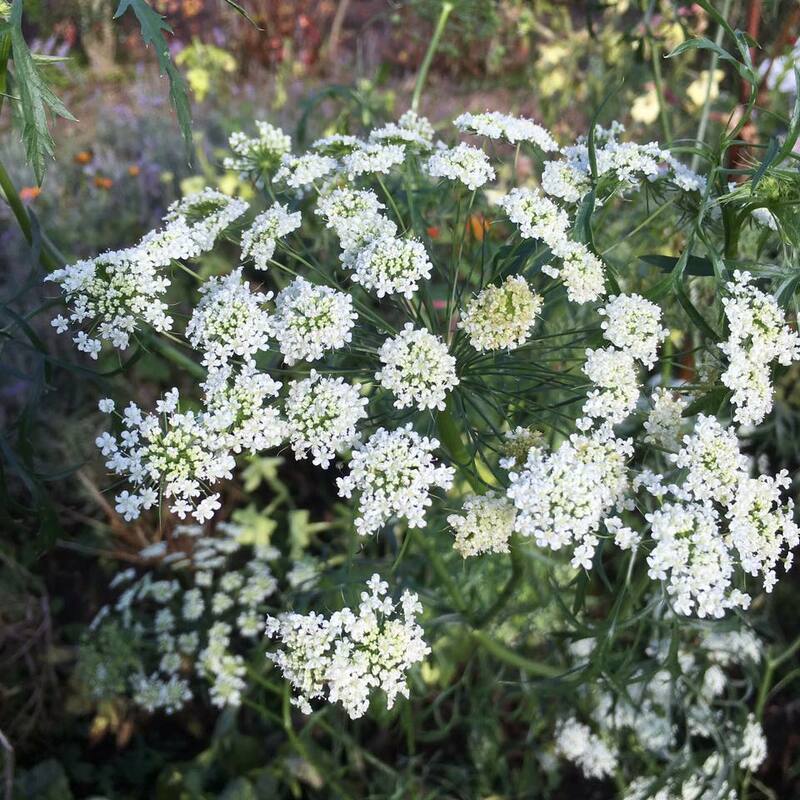 Ammi majus…grown by Tracy ‘Electric Boogaloo’ McQue. When I refer to ‘autumn sowing’, this really means late summer, late August and early September, not really autumn at all, if you, like me, consider autumn to arrive on the equinox (In 2018 this will be the 23rd September). All of our flower growing ancestors have referred to the practice as ‘autumn sowing’ and I wouldn’t wish to incur the wrath of dead people with hoes and forks, certainly, not after the incident with the Ouija board, the sherry and the question to the dear departed about yellow flowers. 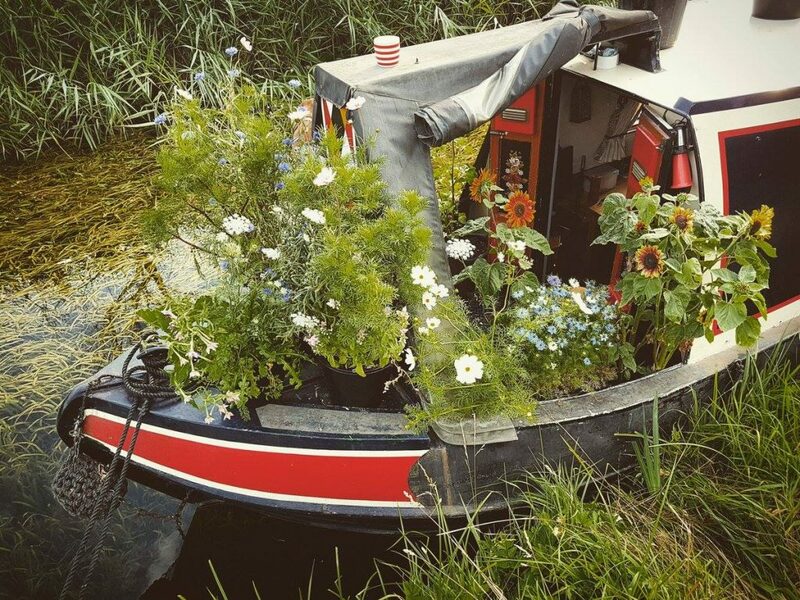 Flash peaking over our boat grown Nigella. There is one big, hoofing issue with sowing seeds at this time of year and that is that it doesn’t always work. Sow too early and your seedlings might bolt and make an embarrassing attempt at flowering, sow too late and the cold wet ground may rot your seeds. However, there are methods by which the shrewd gardener can up their chances of floral success. Let me outline the two strategies that can be utilised. On the boat, I start seeds off in storage boxes. Sowing your hardy annuals in pots in the greenhouse, cold-frame or transparent storage boxes is the most reliable way to start off your seeds. I sow into three inch square pots at the beginning of September. Then I simply make sure they don’t dry out over the winter (but making sure they aren’t waterlogged either). Your seedling will often look pretty sorry for themselves at several points but frankly if you put me in a storage box over the winter I wouldn’t show you my best side. As soon as we have a mild week in March I plant out the little cherubs leaving about a foot between plants. 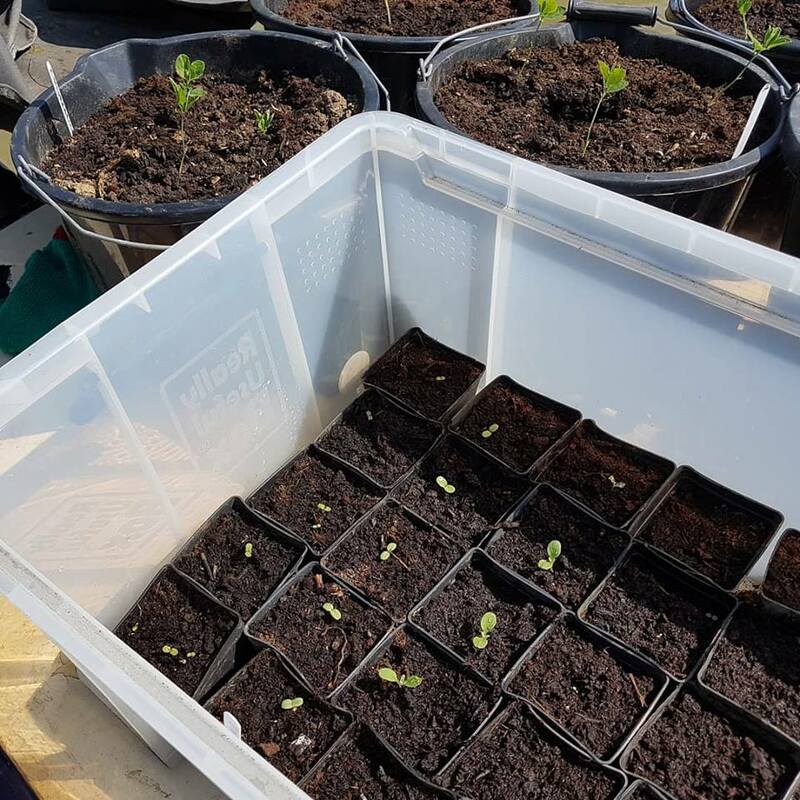 The beauty about storage boxes is that you can simply take the lid off for a week before you plant out and this will harden them off for life outside. If the weather is looking either super wet or super frosty then just hold off planting out. After planting out the seedlings are in the hands of the Goddess Flora and she will wave her arms about and dictate when they will flower. 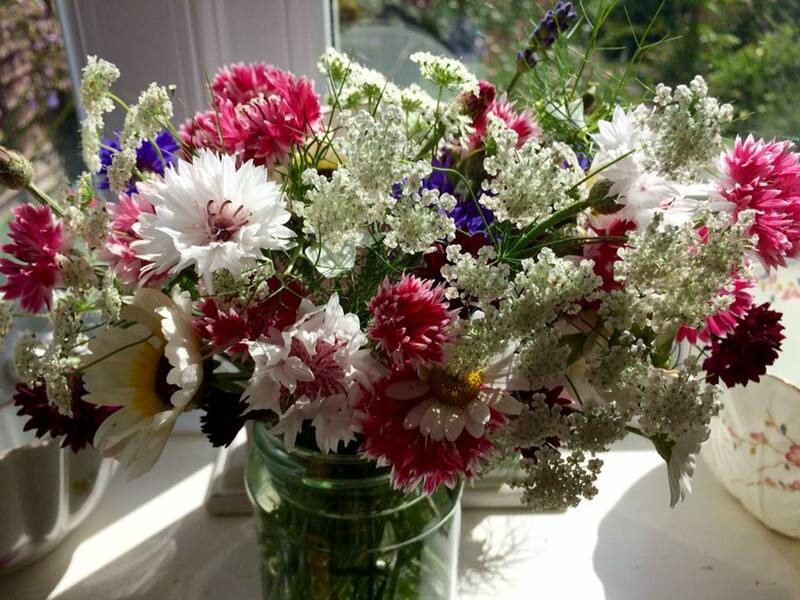 Lots of my customers had annual flowers in the first week of June this year (Biennials flower much earlier of course). Sowing Directly Into The Soil. Cut Flower Patch Beds Can Be This Simple. Three Foot Wide…Three Rows. This is really where things become hit and miss, the stakes are high but the rewards great. Plants that are successfully grown this way will be big and strong and commanding in the following spring but many seedlings get eaten by the pesky wildlife, trampled by cider drinking Hobbits or drowned by Britain’s new hobby of having wet winters. My method for outdoor sowing is simple. Dig a bed that is three foot wide and as long as you have space for. Ensure it is totally weed free. Dig in plenty of compost. 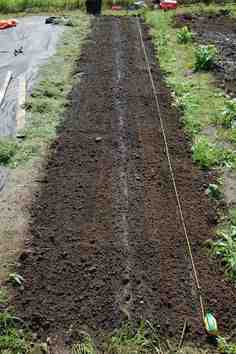 Sow your seeds in straight lines a foot apart running down the length of the bed. Cover the seeds lightly with more compost. Job done. It’s worth pointing out that you can combine both methods. Where you have gaps in your beds, simply plug them with seedlings grown undercover. 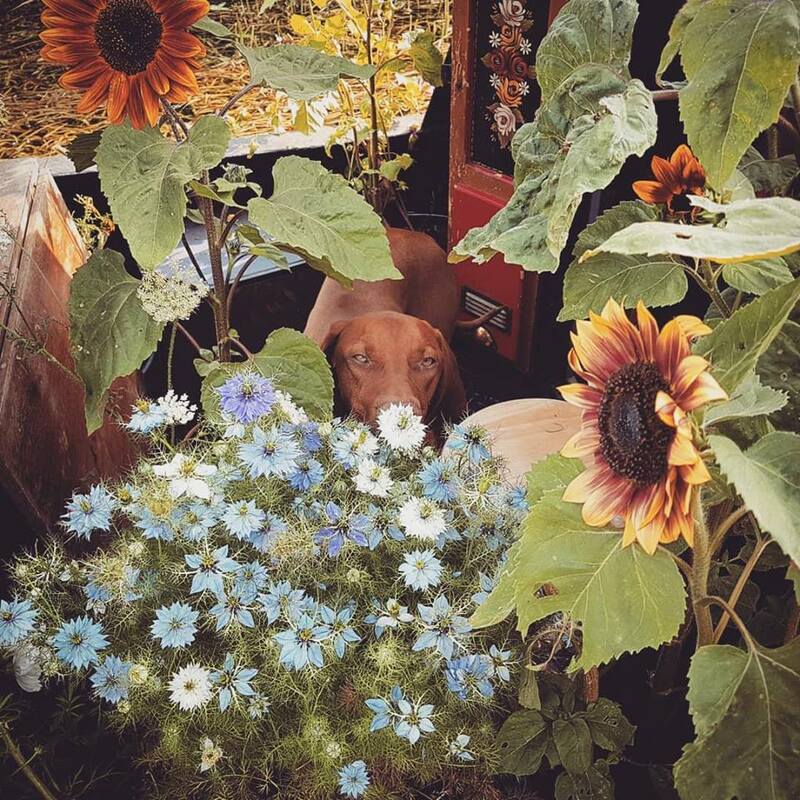 What Are The Best Hardy Annual Flowers To Sow In Autumn? Happily for us flower fiends there are dozens of flowers we can sow at this time. 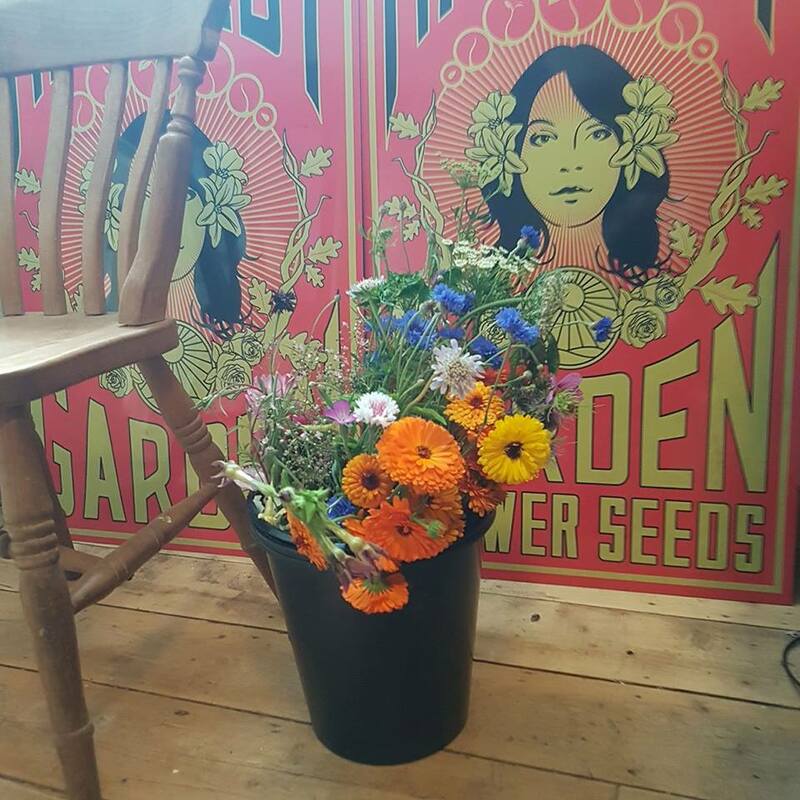 Here’s a sample of the flowers that I grow and which can of course be found in the Higgledy Seed Shop Of Dreams (Hard sell…you knew it was coming). Thx Rosy Bows for this pic. 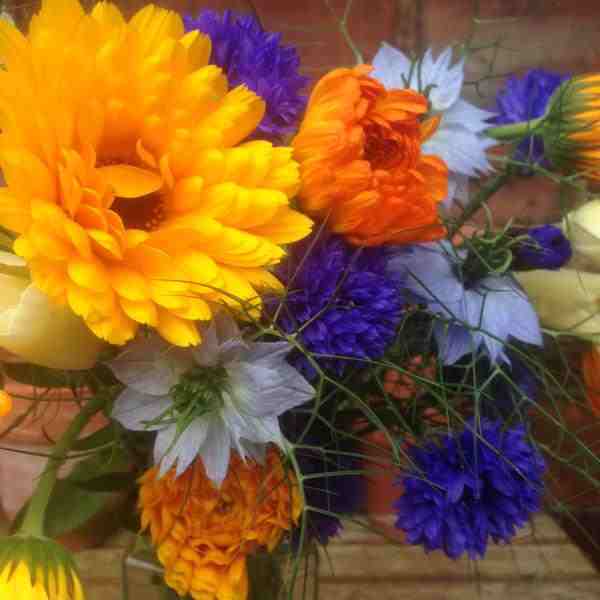 This is wonderful…and the Cornflowers ‘Classic Romantic’ look totally smashing. Larkspur ‘Giant Imperials’, Nigella, Godetia ‘Crown’, Dill ‘Mammoth’, Eschscholzia (Cakifornia Poppy), Chrysanthemum ‘Rainbow Hippy Lovechild’, Calendula, Candytuft, Phacelia, Borage, Ammi majus, Ammi visnaga, Gypsophila, Cornflowers, Cerinthe, Salvia, Daucus carota (actually a biennial but she is happy to play the part of a hardy annual), Malope and Scabiosa. 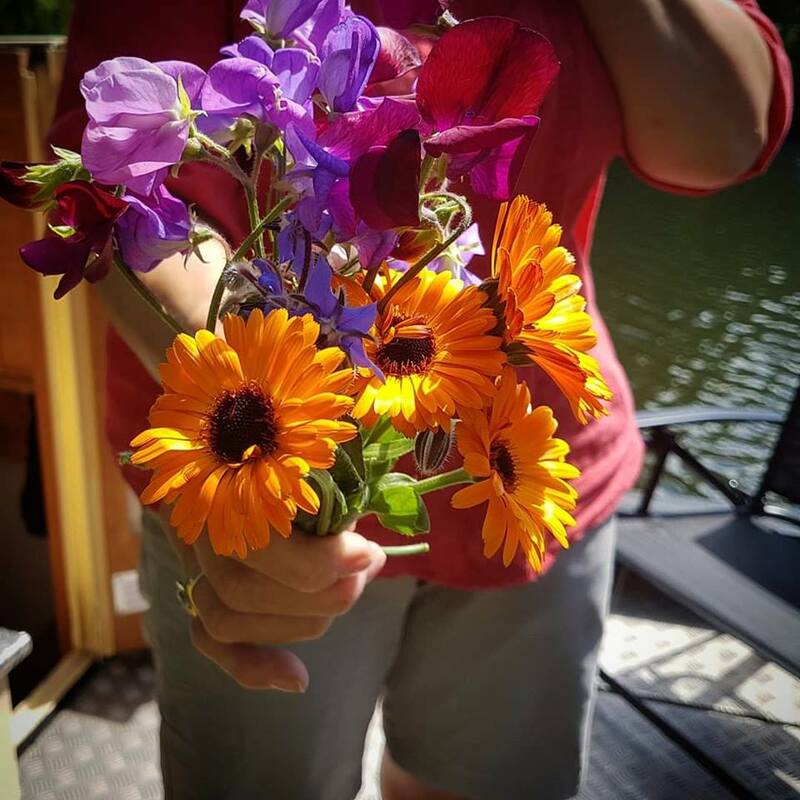 These beauties were grown by Lisa P…my fav combo…the Nigella and Cornflowers look delicious…and…as it happens…all edible. 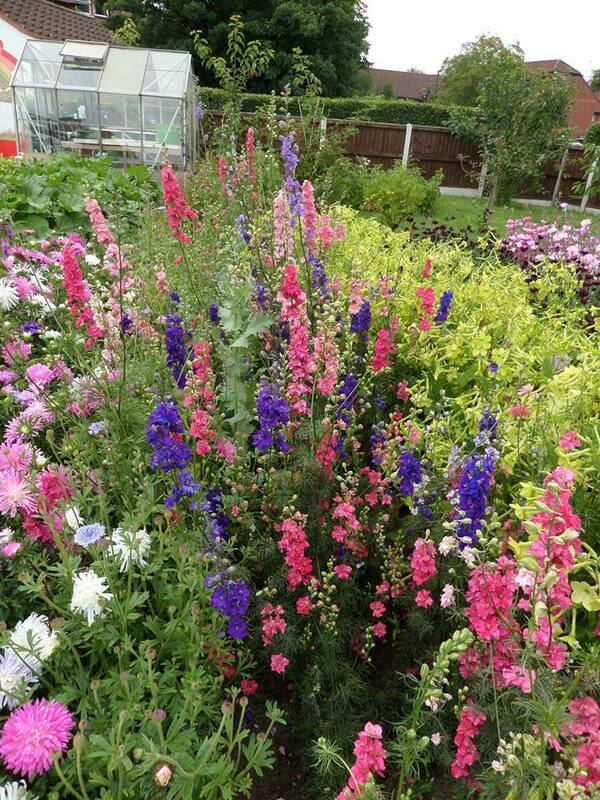 Wonderful Larkspur grown in a community garden. Thanks to Valerie Jones for sharing this photo. If you sign up for the newsletter (see right-hand sidebar) your life will become better than it already is. It says it is a monthly newsletter but I’m far too slack for that in truth. I send perhaps five or six a year and always include a hefty discount code or more usually a bundle of flower seeds at half price. The next offer will be sent out in the late autumn for sowing the following spring. Casper looking mighty…in a flowery sort of a way. PS In other news. Narrowboat Casper is still floating and we are shortly to head off for North Wales. I need to sit tight first until I’ve nailed another 20k words for the forthcoming book (Signed to the good people of September Publishing). The journey to Wales will take several months (We tend not to rush). Come with us and heckle us on the aforementioned social network sites and please let us know how you get on with your annuals. Growing Cornflowers From Seed. The Sowing Of Hardy Annual Flowers In Spring.